Hey Yall….Meet the little woman..Her name is Candy. 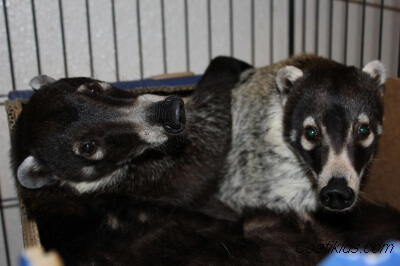 This is us attempting to snuggle and relax while Coatimom is a buggin us with that dang ole flashy camera thingy. Yep, we are likin this box. 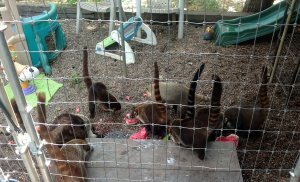 Coatimom pretty much gives us the run of the house but there is nothin like stealin somethin out of trash and makin it your own. 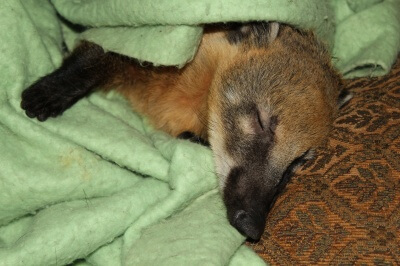 I know whatcha thinkin, Coatimom spent a small fortune on them fancy beds and fleecy blankets but dang. 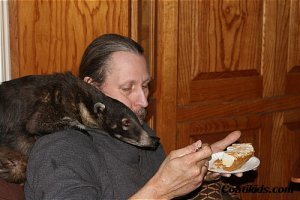 I’m a simple Coatiman, down to earth if-in ya know what I mean. Gimmie an ole box any day. 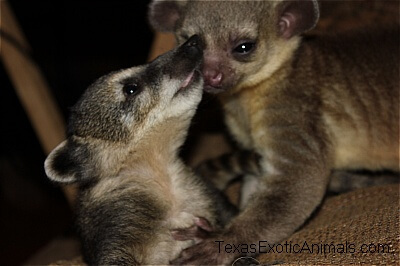 Our newest sweetie pie Coaitkid, Jeep and our Newborn Kinkajou Pepito are romping playing like best friends. It’s a joy to watch. They are the sweetest babies. 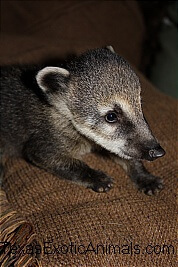 The worlds most famous Coati? O.K. you decide is the Character known Eugene the Jeep (who had extraordinary powers but only said “jeep”), from E.C. Segar’s comic strip “Thimble Theater” (also home of Popeye the Sailor)a real space alien doggy or the creation of someones imagination based on the Coati? Eugene the Jeep first appeared in the strip March 13, 1936. P.S. 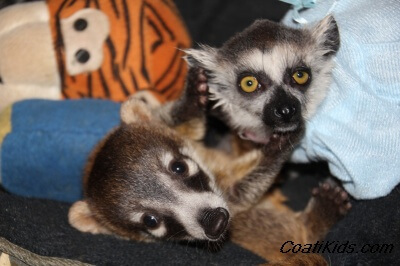 Enjoy the cartoons and let them take you back (if you anywhere near my old age) to your childhood and what Saturday morning cartoons and the previews before a feature film at the movies where really about…..
Bailey the Lemur or Callie the Coati? Sometimes I am just the luckiest girl in the world! 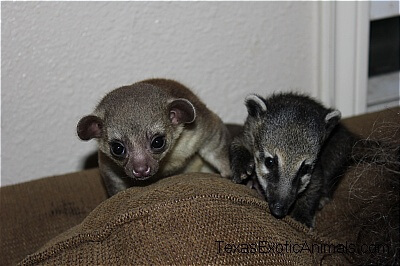 I am babysitting four sweet baby Coatis. 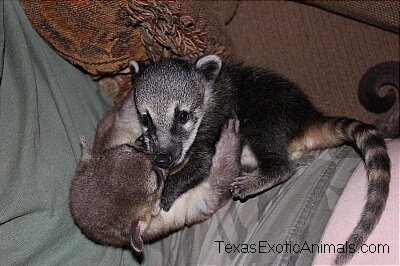 I absolutely love bottle feeding baby Coatis and other little critters. 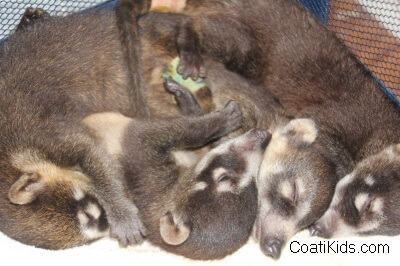 These four little sweeties just had their bottles and are now napping peacefully with fully bellies and happy dreams…..Milk it does a Coati good…………. My poor special precious Honey Bunny girl. She is just tuckered out. First a bath and then a practice session with a harness and leash..After a sugar high from all the treats we tried to use to balance the work with the harness, I think she just tuckered herself out. She cuddled up with us on the sofa and went off to dreamland..snoooozing away! Our local town is going to have a pet fair tomorrow and we are going to take Honey. She is normally very gentle and kind and had no problem dealing with other animals or people so we will give it a whirl. 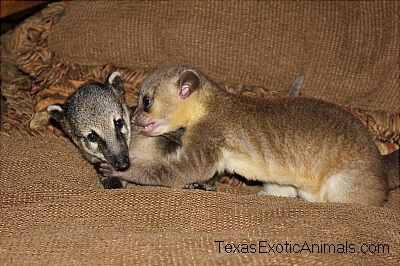 Our Coatikids are always a crowd pleaser and alot of fun to bring out. Looking forward to a fun day tomorrow. 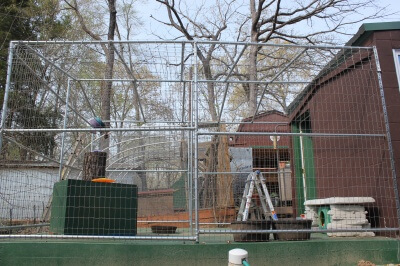 Although we are still working on the inside, the weather is great and it gives our CoatiKids more freedom to move about 24/7. We let them move in for now. 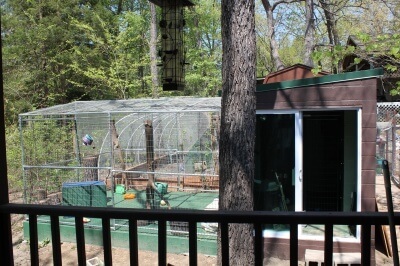 We have plans to build an outdoor tree house in the patio area for them to nap in on hot summer nights. The box you see in the picture is the insulated house body. We will mount it on the tree stump and add a balcony with lots of climbing stairs around it. The plans for the inside are pretty much the same except less wood and more wire shelves converted from a jungle gym of climbing and nesting areas with stuffed pillows and pet sleeping bags. 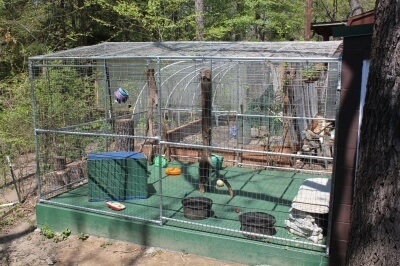 During the summer we will have a swimming pool for them and of course there will be plenty of toys and treats. Coati Cottage is at 98% done! 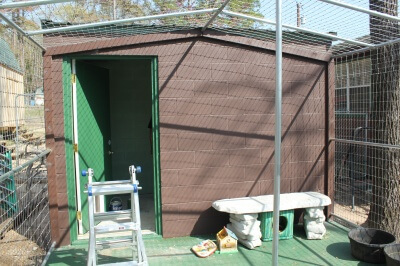 We managed to finish the exterior. I absolutely love the color we picked for the inside. If you can’t tell from the picture it is a soft pastel green, not baby puke green, which would be nasty LOL. Kerry brought a nice heavy very attractive cement bench for us to sit inside the pen with our CoatiKids. The floor and outside walls are painted to match our house. I would love to paint a jungle mural on the walls inside and out, but I am not the best artist. We added the automatic water thing Kerry designed and heater inside, a few toys and an insulated clubhouse and inside nesting/sleeping area. 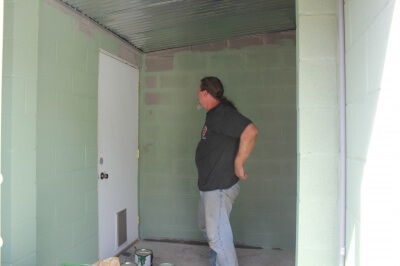 We still have much to do to furnish the inside to provide them with lots of activities. More Photographs coming soon……..